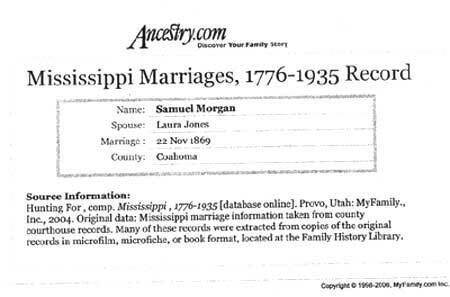 Samuel married Laura Jones on November 22, 1869. Born about Oct 1853, and daughter of .....Timber. v. Richard Morgan was born in Mar 1879. He died in 1958.
ix. Edward Morgan was born in Feb 1891 in Marks, Coahoma County, MS.
xi. Fred Morgan was born in January 1896 in Marks, Coahoma County, MS.
Richard Morgan (Samuel) was born in Mar 1879 in Marks, Coahoma County, MS. He died in 1958 in Memphis, TN. Richard married Cora Williams. Cora was born about 1883.
they had a son, Clyde........... (Louise and Clarence Morgan Sr. were first cousins, about the same age, and raised together). and daughter of William and Ada Taplin) . i. Alice Marguerite Morgan (Clarence, Richard, Samuel) married George Calvin Grant on......in Memphis, TN. George was born on ............Son of Willie and .....Grant. Clarence was briefly married to Elsie Thomas, daughter of .........................Thomas of Marshall, Texas. iii. Richard Morgan (Clarence, Richard, Samuel) was born Nov 9, 1955, in Memphis, TN. and is the daughter of William Douglas Morre and Cleora Johnson Moore. i. Corry Morgan, born January 30, 1973 in St. Louis, MO. ii. Douglas Morgan, born February 12, 1975 in St. Louis, MO. Richard married Renee Grayson in Los Angeles, CA on July 21, 1977 and born June 8, 1953. Daughter of Clarence Grayson and Middie Dunmore Grayson. iii. Rikisha Lauren Morgan, born September 10, 1980 in Los Angeles. iv. Richard Laurence Morgan Jr., born June 17, 1984 in San Francisco, CA. vi. Renetta Denise Morgan, born May 6, 1986. Corry Lamont Morgan (Richard, Clarence, Richard, Samuel). i. Corry Lamont Morgan Jr.
Douglas Brandel Morgan (Richard, Clarence, Richard, Samuel). Rikisha Morgan (Richard, Clarence, Richard, Samuel). Rikisha united with Mekeion Payne, Sr.
Richard L. Morgan Jr. (Richard, Clarence, Richard, Samuel). Renetta Denise Morgan (Richard, Clarence, Richard, Samuel). i. Jimmy Lee Coleman, Jr.